Underwater Headphones. It sounds like a contradiction in terms, doesn’t it? At Underwater Audio, our goal is to create the best underwater listening experience possible, and that includes creating the best underwater headphones for swimmers. This is no easy task: as you’ve probably noticed, ears come in a huge range of shapes and sizes. 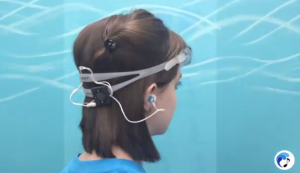 For headphones to work underwater, in addition to waterproof components, they need a watertight seal so that the sound reaches your eardrum unimpeded. If water gets between your eardrum and the earbud tip, whatever you’re listening to will inevitably sound muffled and distant, like someone yelling at you from above the water. At Underwater Audio, one of our solutions has been to create a variety of headphones and multiple styles of versatile earbud tips in a range of sizes. And our commitment is that everyone will find something that works for them. 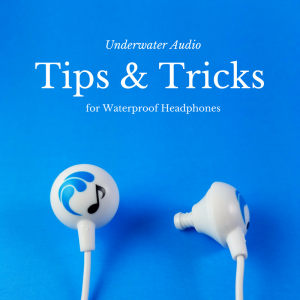 Here, we’ve compiled our best tips, tricks, and resources for getting the most out of the waterproof headphones we’ve created. If you’re looking for great sound underwater, the following can help you achieve that. One of the most important things you can do to get the most out of your headphones is to take care of them. I know I’ve had headphones I’ve loved and unintentionally destroyed by letting the wires get stretched, kinked, and stripped. Add water into the mix, and things get even more tricky, right? Well, not really. Here are some simple things you can do that can prevent problems and prolong the life of your headphones. Does this mean you can’t take your headphones with you when you’re iceberg surfing? Nope, but the freezer might not be the best storage spot for them. Did you know that on a 100° F (38° C) day, the interior of a car can reach 172° (78° C)? That’s hot! We suggest not leaving your headphones in the car or outside in the elements. The is the one that’s gotten me in the past. I get lazy, and I just grab the cord and yank. Before I know it, the wires have gotten pulled to the point the sound degrades or disappears entirely. Get in the habit of grasping the plug itself. No matter where you’re swimming, you’re going to have something else in the water: chlorine, salt, weird-looking microorganisms. Your headphones are going to stay in the best shape if you get that stuff off of there before they sit around. Just a quick rinse from a shower or tap can make a big difference. Pat them down with a towel or paper towel. We include carrying cases with the Swimbuds Sport and HydroActive headphones. Those are a great option for storage. After rinsing and patting them down, you can just gently wrap them around your fingers. I just hold the earbuds between my thumb and index finger and then wrap the rest of the cord gently around my hand. For headphones to work most efficiently, the source of the sound needs to point directly at the eardrum. Underwater and waterproof headphones have the added element of requiring a watertight seal so that the path of the sound is clear. So, the first step toward getting a good sound underwater is making sure the headphones are positioned correctly. 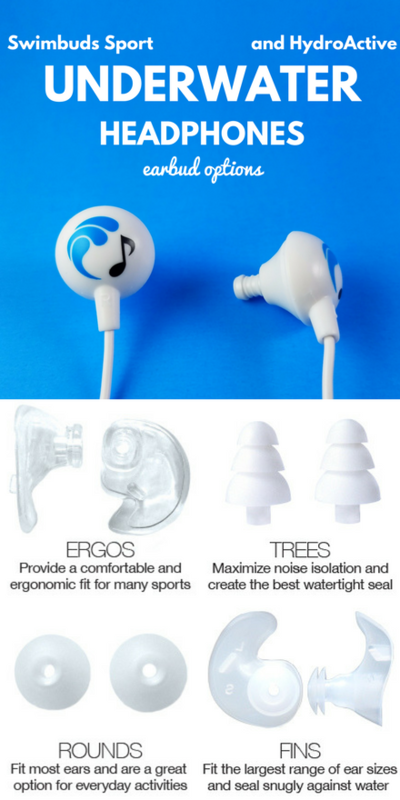 Swimbuds are our standard design for underwater headphones. We stand behind them, and many, many of our customers swear by them. If you’re using Swimbuds, your job here is simple! Just find the size that fits most securely and comfortably for you. Swapping out the Swimbuds tips can seem daunting, but don’t worry: they’re designed for it! Make sure you hold the tip at the base, and twist it a bit to the side as you pull it off. To put a new one on, start from the side, then twist the tip into place. With our Swimbuds Sports and HydroActive headphones, however, we keep reaching higher with improved, innovative designs. These include providing both style and size options so that no matter the size or shape of your ear, you can find something that works for you. See the video below (under Inserting Earbuds) for an overview of the styles of tips offered with both the Swimbuds Sport and HydroActive Waterproof Headphones. Insert them like you would a pair of earplugs. To do this, if you were to insert into the right ear, use your left hand and reach over your head and grab the top of your right ear. Gently pull toward the ceiling. This will open up the ear canal so that you can directly insert the earbud. When it is in let go of your ear with your left hand. This allows the ear canal to close over the ear bud and keep a good fit and sound. To watch a demonstration of this, watch the great video guide a couple of our fabulous employees made. 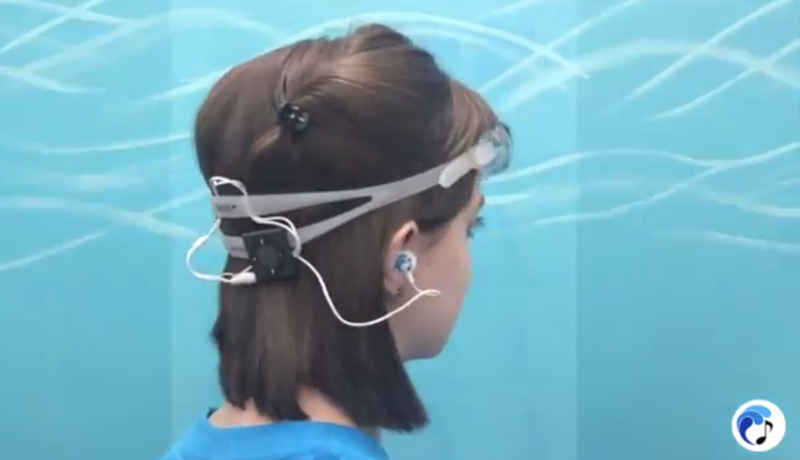 The video specifically features the Swimbuds Sport headphones (and the older blue model of the Fin tips) but the information on the earbud tips is also relevant to the HydroActive headphones. For some styles of earbud tips, having a little extra something to complete the seal can make a big difference. The earbud tips on the Swimbuds keep water out by pushing against the sides of your ears. Adding a dab of petroleum jelly before you insert the earbuds can fill in any gaps and give you a much more secure seal. 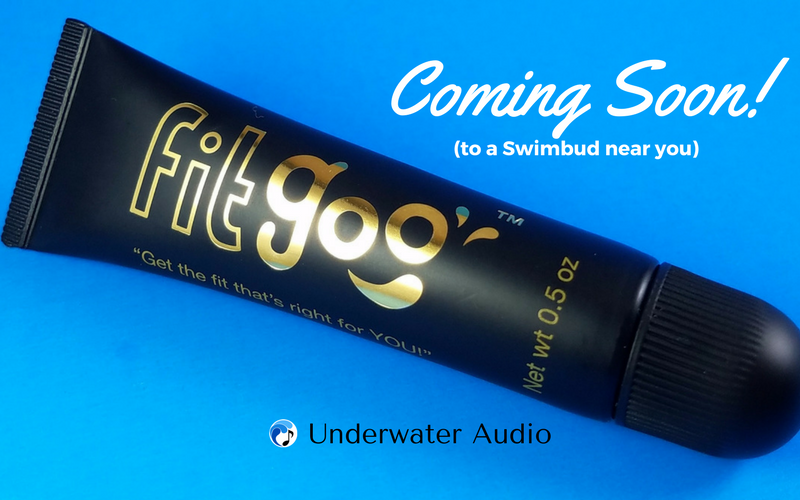 With this in mind, Underwater Audio has created a new product whimsically called FitGoo. It’s an all-natural petrolatum blend that gets you the fit you want for your underwater headphones, and more. With tea tree oil and honey extract to help guard against fungal and bacterial infections, FitGoo also helps keep your ears healthy, and it actually smells pleasant as it does. Once you’ve got your earbuds in the right place for the best sound and an optimal seal, one of the tricky things for swimmers is keeping them there. 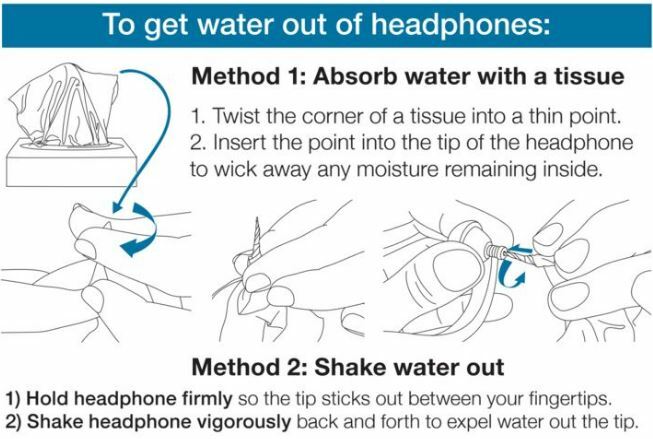 If cords get tugged or earbuds get bumped, the headphones can shift and water can leak in. Long cords can get tangled easily, especially during flip turns, which is why we make our headphones with short cords (and include a longer extension cord for when you need it). For swimmers, we recommend that you run the cords behind your head and attach your waterproof iPod or MP3 player to your goggle strap. Short cords tucked under goggle straps reduce drag and don’t get tangled – try tucking the cord right above your ear like the illustration below. Put your goggles on first, then clip the waterproof player to the back of the straps. Secure a bit of the cord under the goggle strap. For less drag and extra security, arrange the cord as in the illustration below, so that the cord runs directly down to your ear from under the strap. Insert the earbuds after everything else is secure. 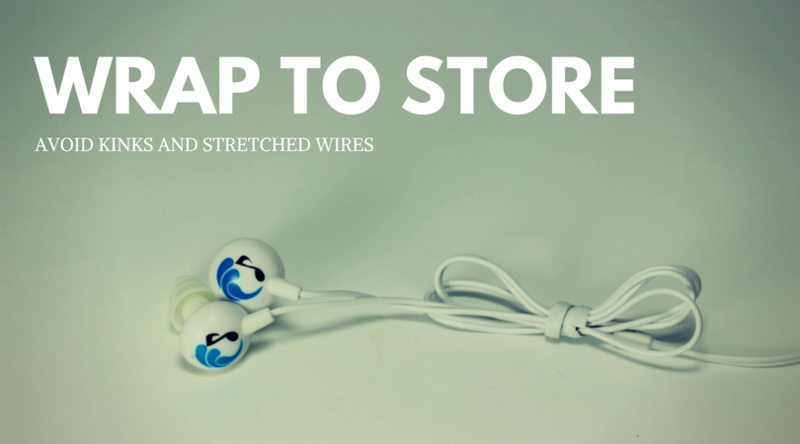 A swim cap can be an extra layer of protection and security for your earbuds. If you want your goggles and iPod accessible over your swim cap (as illustrated below) fold your cap above your ear while you get cords and everything situated, then insert your earbuds and fold the cap down. Put on the swim cap and goggles. Slip the earbud and a bit of cord under the goggle straps before inserting earbuds into your ear; cover your ear with the swim cap. Clip the waterproof iPod to the goggle strap and tuck the remaining cord into the goggle strap. Alternately, you can slip the earbud and a bit of cord under the goggle straps before inserting earbuds and cover with swim cap. Then clip the waterproof iPod to the bottom of the cap and tuck the cord bundle up underneath. Put on goggles last. Sometimes it’s possible for a little bit of water to get inside of the earbud tip and muffle or block the sound. Not to worry; it’s actually very simple to take care of that! Something else we’ve found is that debris in the headphone jack can prevent a connection between the iPod (or SYRYN) and the headphones. This can cause muffled sound (or no sound at all) and, again, is extremely easy to fix. Just use a toothpick to remove any lint or debris from the jack. Simple, right? 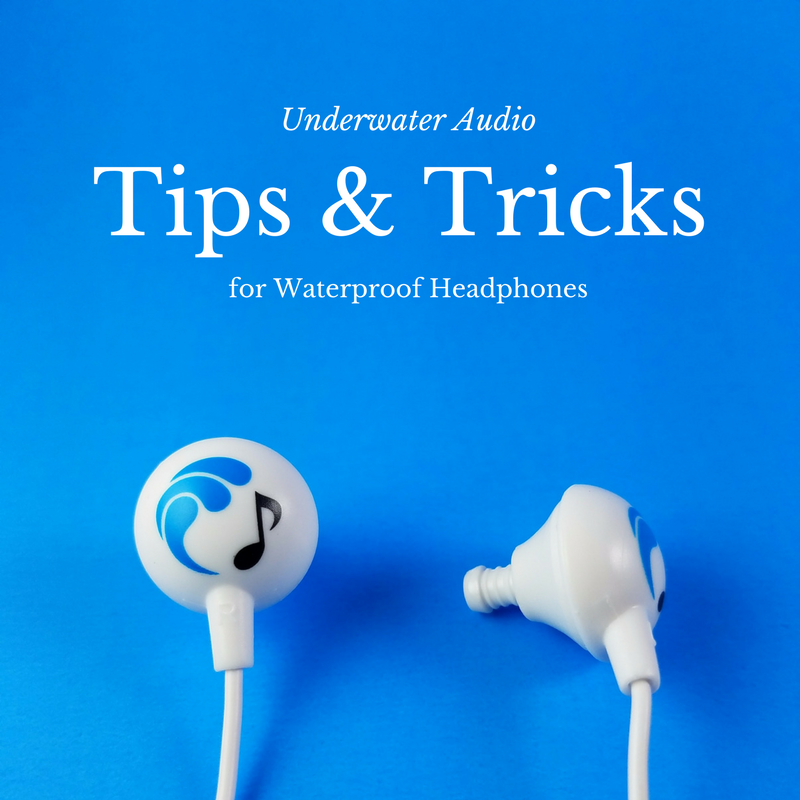 For more information on all the styles of waterproof headphones offered by Underwater Audio, check out Waterproof Headphones: Underwater Audio’s Comprehensive Guide.